Seen a nice pair of Aldo heels on Ebay, I never bought a pair from Aldo so I have no idea how they size their heels. I find Heels from New look, Faith and Next fit fine. I take a uk9 wide but don't always buy in a wide sizing. The 1 pair from I bought from Topshop run small. I have 1 pair from Aldo and they seem to fit true to size. 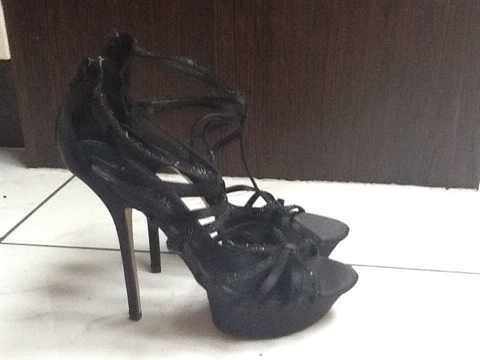 Just to contract myself, I had/have listed on an auction site, a pair of ALDO high heeled courts marked/sold as UK 8. They are not an 8. In fact they are barely a 7. It's not just me. Several reviewers have commented they've had to go up a size. I can get them on -I sometimes take a 7 in a court shoe- but they would hurt after a while so I'm trying to move them on. For the most part I've found Topshop/Dune/Lipsey tend to come up a half to a whole size small for me, and I have slim-ish feet. I think I've commented before, some brands don't even have the same sizing gauge between styles. Can't think exactly who I had in mind, though "Barratts" seems likely, and it meant/means ordering online is nothing less than a gamble. If the brand gets it wrong a couple of times, would you go back for a third try? I think not, which might help explain the demise of the brand. I've had similar failures with ASOS. Ordered shoes in a UK8 several times and had to return them. Yet I have some lovely block heeled ankle boots from them, in a UK7?